With 20 years of research, over 900 patents, and the world’s largest 3D printer, the Invisalign system is the leader of clear aligner technology for today’s orthodontic patients. We now offer Invisalign for both teens and adults at I Song Orthodontics, where we work to give you a movie stay caliber smile without bringing too much attention to the process of straightening your teeth. Invisalign is one of the best ways to go under the radar when straightening your bite, straightening a crooked smile, and even bringing together minor gaps in between your teeth. Since 1997, 5.5 million smiles have been improved using the Invisalign system. Invisalign’s proprietary SmartTrack medical-grade plastic will help you achieve a flawless smile quickly and comfortably. Every contour and edge of your Invisalign clear braces is customized specifically for your mouth, unlike other pre-formed clear aligners that can damage your gums. And with Invisalign, you can complete your orthodontic treatment in as little as six months. 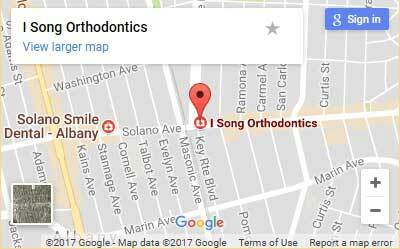 Beginning your Invisalign treatment starts at your orthodontist office. With over 88,000 providers, it’s easy to find a licensed specialist near you. Once your orthodontist has determined you are a candidate for treatment using Invisalign, a treatment plan will be discussed. The first step in the Invisalign treatment is to make a digital 3D image of your mouth. Not to worry – there are no squishy mouth molds with Invisalign. With the iTeroElement scanner and ClinCheck software, your dentist can quickly map your smile and course of treatment. You will even be provided with a preview of your future smile! Once your treatment plan has been approved, your clear aligners will be custom manufactured just for you. Treatment begins when you pick up your first aligner at your orthodontist office. Depending on your unique situation, you will wear this and each successive aligner for as little as a week or up to one month. At which point, you’ll be instructed to switch to the next aligner in the series. While undergoing Invisalign treatment, you can still eat the foods you love. And there’s no need to worry about the hassle of keeping complicated orthodontic appliances clean. Just continue to brush and floss daily to keep your smile healthy. For best results, be sure to wear your Invisalign clear aligners for 20 to 22 hours per day. To see if you are a candidate for treatment with Invisalign, request a consultation with I Song Orthodontics today.